In medium nonmetal bowl, beat orange juice, peanut butter and curry powder with wire whisk. Add chicken, turning to coat. Cover; refrigerate, turning once, at least 1 hour but no longer than 24 hours to marinate. Heat gas or charcoal grill. Remove chicken from marinade; discard marinade. Place chicken and bell pepper on grill rack over medium heat. Cover grill; cook 15 to 20 minutes, turning once, until juice of chicken is clear when center of thickest part is cut (170°F). To serve, cut chicken breasts diagonally into 1/2-inch slices and bell pepper into 1/2-inch strips. 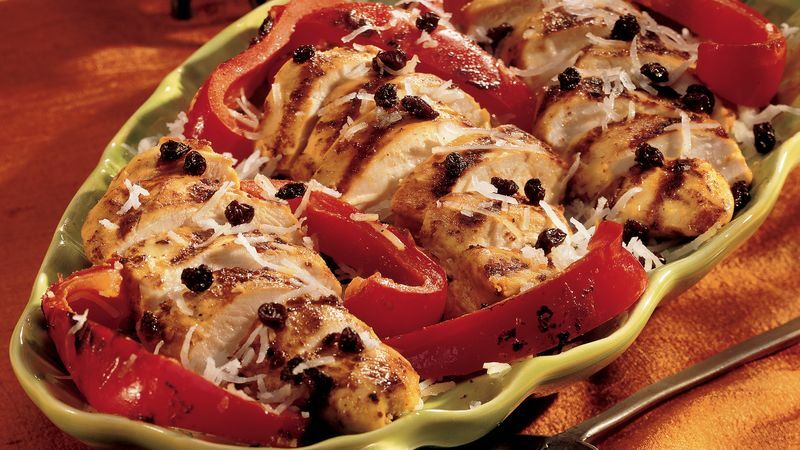 Top chicken and bell pepper with coconut and currants. Serve with rice. Salt is usually omitted from a marinade because it tends to draw out the juices of uncooked meat and seafood. For best results, salt food only after it is grilled. To prevent food from sticking and to make cleaning the grill easier, brush the grill rack with vegetable oil or cooking spray. Do this before heating the grill, so you won't be handling a hot grill rack.